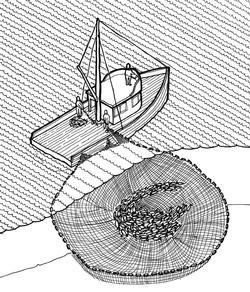 A modern tuna purse seine vessel. _Today, bluefin tuna support a worldwide $7.2 billion industry. An international fleet of thousands of long-liners catch millions of tons of tuna every year. The major consumers include Japan, the United States, Canada, Spain, France, Italy, China, Australia, New Zealand, South Korea, Taiwan, and New Zealand. The fish are caught using a variety of methods, including hook-and-line, harpooners, purse seine, and most important, long-line. This site through the Monterey Bay Aquarium summarizes how these methods and others work. Current sustainability profile of Atlantic bluefin tuna. Modified from Seachoice. Mediterranean Sea (Northern bluefin) – In this region, wild tuna are caught, fattened, and slaughtered. The fattening technique was developed by a group of Croatians, who first worked with Southern bluefin in Australia. In 1996, the first tuna ranch in the Mediterranean was established. Here, newly caught tuna are placed in coastal sea sages and fed oily fish like anchovies or sardines for months to years. When they are finally killed, the flesh of the fish contain the high fat content that Japan and other consumers look for.